Hi, I am interested in your 1939 Ford Deluxe (stock #4934-CHA) listed on Autotrader for $30,995. I'd like to get more information about this vehicle and confirm its availability. 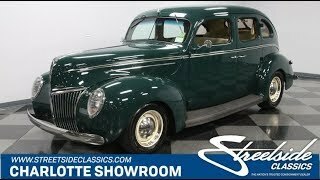 Somewhere between the ultimate sleeper and a very unique custom lies this 1939 Ford Deluxe Sedan. With a stroker V8, A/C interior, overdrive transmission, and a slick (but understated) paint, this is a carefully crafted custom classic. A pre-war Ford is the kind of car that will always grab attention, but this one does it a bit better. The fastback body is sleek without losing any of its back-seat practicality. The body has been painstakingly worked on and great modern clearcoat paint has been added so that the curvaceous steel now has an awesome reflection in the sunlight. But this dark green is understated enough that it really drives home a sleeper personality. Theres no wild flames down the side. Instead, you get a tasteful tan pinstripe that coordinates with the wheels. Items like the LED taillights, dual exhaust tips, and a hint of forward-leaning stance are the few subtle hints at the more modern upgrades within. But really you love this one because it has the bright chrome and straight body that makes it look like a terrific pre-war cruiser. Another great reason to go with the sedan for the custom build is the set of classic suicide doors. No matter if people peek into the front or rear, they will see a tastefully modified machine. The tan cloth on the button-top seats looks like it could be period-correct, but its freshness tells you this was a much more recent investment. Brown carpeting, brown seat piping, and dark brown wood come together to create an awesome package that tells you someone took their time coordinating this interior. This large sedan has plenty of legroom, and it can keep everyone happy thanks to features like the AM/FM/cassette stereo and modern R134a air conditioning. And more than just comfy, this custom build was made for driving. The grippy banjo-style steering wheel is mounted on a tilt column, and beyond that are a great set of VDO gauges. When you lift the hood, youll instantly recognize the upgrade. The Flathead motors from this era are quite nice, but when youre trying to fit maximum power in a small space, nothing beats a small block stroker V8. Topped with a four-barrel carburetor, this powerful 383 cubic-inch motor makes a throaty rumble from the glasspack-style dual exhaust. So you might not be able to hide this Fords true sleeper nature. The front end has been upgraded to a drop axle setup with thick front sway bar. Plus, there are other great driving additions like the power steering, front disc brakes, and four-speed automatic transmission w/overdrive. So youre looking at the perfect mix of vintage style with all the right power and comfort upgrades. This is a beautiful and unique custom, so it wont stay available for long. Call now!